The Dumbo octopus is a deep-sea animal, so no. You can't kept it as a pet. The Dumbo octopus is an unusual, beautiful animal rarely seen alive outside its natural habitat. Many other octopus species can thrive as fascinating interactive pets in marine aquaria if their particular needs are met. Dumbo octopuses belong to the genus Grimpoteuthis, which includes 17 known species. The primary reason they can't be kept as pets is because they live in deep, dark ocean waters, 1,500 to 6,000 feet below the surface. Dumbos cruise just above the ocean floor looking for food. They crawl, hover, or swim using the earlike fins that give them their name. Dumbos differ from most other octopuses -- they have a hard inner shell, their arms are webbed, they don't use jet propulsion, and they have no ink sacs. They have no radulae, so they swallow their food whole. The Dumbo diet most often includes worms, bivalves, copepods and crustaceans. The common octopus (Octopus vulgaris) and the bimac (Octopus bimaculoides) are comparatively easy to keep but require a tank of at least 50 gallons. The pygmy octopus (Octopus joubini) and dwarf octopus (Octopus mercatoris), are suitable if you're limited to a tank of less than 30 gallons. Octopus briareus is known for being friendly and social, and the walking octopus (Abdopus aculeatusis) can make an entertaining pet. These species dwell closer to the sea's surface, making them much better suited tor your marine aquarium than a Dumbo. Although octopuses and coral are both marine creatures and some of their tank requirements are the same, octopuses don't thrive in reef aquariums. Most octopuses are nocturnal, requiring only dim light. Rocks, shells, PVC pipe and glass jars provide hiding places that octopuses need to live comfortably. Octopuses are active; they require more oxygen in their water than most invertebrates. A completely secure environment is essential for an octopus aquarium, because an octopus can squeeze through very small openings. 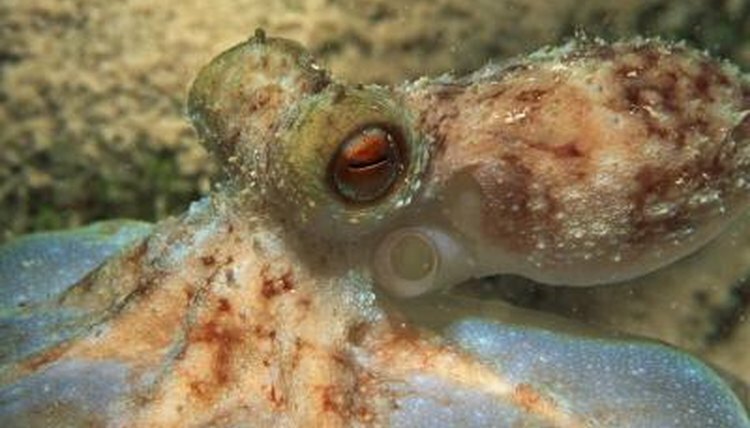 Octopuses can handle a range of water qualities. They continuously shed skin and suckers, so a strong mechanical filter is needed. A carbon filter will keep the water clean if your octopus inks. Power heads are too strong for an octopus, so use other means to circulate water. Octopuses eat snails, crabs and other crustaceans, so don't house them with these animals. They'll also eat smaller octopuses, so tank mates should be of the same size. Although octopuses won't eat them, cnidarians can sting your exploratory octopus and so are not suitable tank mates. Octopuses shouldn't subsist on feeder goldfish, which are high in saturated fat. Live marine mollusks and crustaceans are best because hunting is good for an octopus, but thawed frozen food also works. Most pet stores carry live feeders like ghost shrimp or glass shrimp. Captive octopuses generally only live one to two years. Larger ones fare longer than smaller ones, generally, but even under the best conditions these animals are comparatively short-lived. During their brief existences, octopuses need stimulation to stay happy. They're intelligent animals. They need toys and challenges to keep them occupied. Understimulated octopuses can develop a number of unhealthy behaviors including seclusion, eating the tips of their arms and obsessively crashing into the sides of their tanks. Even plastic balls and cat toys -- use no metal -- can help keep a captive octopus entertained. Food hiding games also entertaining to many octopuses. If you don't have time to devote to playing with your octopus, you don't need one in your tank. MARINEBIO: Finned Deep-sea Octopuses, Grimpoteuthis spp.